A lymphoma may affect the whole gland, but is often found only on one side. The regional lymph nodes are often affected as well. In about 70% of cases lymphoma arises from a preexisting chronic lymphocytic thyroiditis (Hashimoto’s thyroiditis) [6,7,20]. The tumor is strongly hypoechoic, often well marginated, but usually causes enlargement of the affected lobe. The echo pattern varies from micronodular to homogeneous. Thyroid lymphomas are usually poorly vascularized, but may also show blood vessels with chaotic distribution . 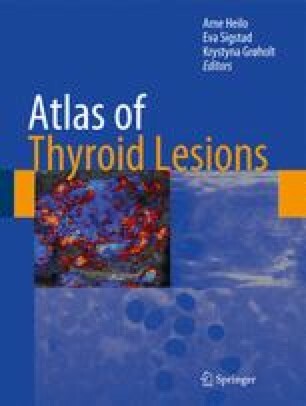 The micronodular lymphomas may resemble Hashimoto’s thyroiditis, and may also be surrounded by thyroiditis.